Qatar's powerful prime minister is preparing to step down as part of a wider power transition that may also see the country's ruler ceding power to his son, Crown Prince Sheikh Tamim, Arab and Western diplomats have said. Such a change could inject an element of uncertainty into the foreign policies of the major gas exporter, which is a global investment powerhouse and a bankroller of Arab Spring revolts in alliance with the Muslim Brotherhood. 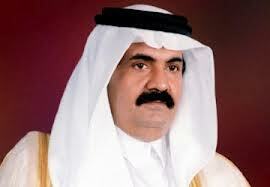 "(The Emir) has had (this) in mind for quite a long time. The path has clearly been paved over the past year for authority to be transferred to Tamim," a Doha-based diplomat told Reuters, referring to head of state Sheikh Hamad bin Khalifa Al-Thani. "The plan has always been for this to happen, but it's been a question of timing." The diplomats said they understood the motive for the reported reshuffle was the desire of the leadership to have a smooth transition to a younger generation. Such a move would be relatively unusual in Gulf politics. I guess it's better to hand over power than take power in a bloodless coup d'état like he did to his father.